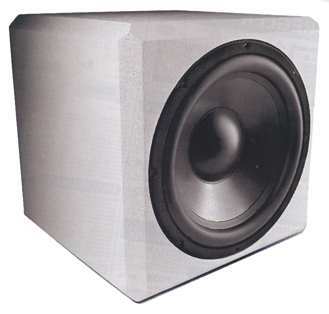 Versacube is a sealed cabinet subwoofer equipped with the affordable Mivoc AW 3000 bass driver. Depending on the crossover frequency of the subwoofer module the subwoofer's frequency response varies, since the maximum efficiency is somewhere between 70 - 100 Hz. On its own the Versacube is not a low bass expert, since a sealed cabinet speaker need a driver with a lot of excursion to produce low frequencies. On the other hand bass reproduction will be tight and clear (as has to be expected from a sealed cabinet). The magazine Klang+Ton recommends to stack 2, 4 or 6 subwoofers; 6 subwoofers represent already a height of 2.20 metres. In this case the tower should have a base and the cabinets should be attached to one another. The picture on the right shows some of our stacking suggestions. Considering a matrix of 2 subwoofers each in parallel, the partnered subwoofer has to carry a load of three to four times the planned power, when the partnered subwoofer blows; therefore, the voice coils are in series. As the diagram on right shows, the partnered subwoofer in series is protected against damage of the voice coil. Especially subwoofer modules with low bass boost are recommended, since the sub develops the maximum volume between 70 and 100 Hz. An adjustable, slight bass boost is desirable. Instead of stacking six subwoofer modules, it might be a good idea to have two towers of three with two subwoofer modules, possibly even running in stereo. The subwoofer modules could either be fitted into a separate enclosure or into the Versacube. The resulting volume loss won't have an effect on the bass reproduction.